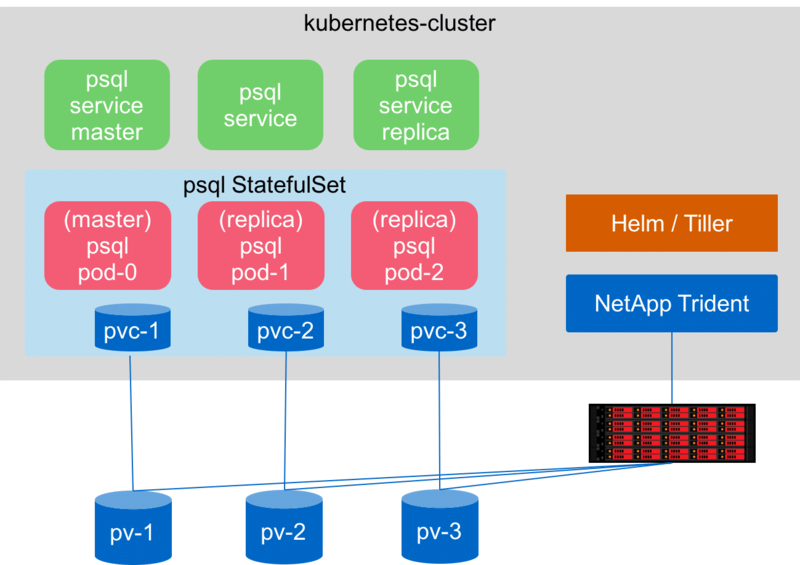 PostgreSQL is a popular open-source relational database, and in this post you will see how you can deploy PostgreSQL in a Kubernetes environment using Helm charts with Trident, a dynamic storage provisioner from NetApp for Kubernetes. You will also learn how you can offer standard PostgreSQL deployments using templates (Helm) which do not require any storage pre-provisioning. Moreover, we will see how easy it is to scale and cleanup the PostgreSQL instances. I have posted the related code on github and also created a demo video for your reference. Which PostgreSQL container image did we use? We used the PostgreSQL Docker image provided by CrunchyData for this deployment but you can use any PostgreSQL image of your choice. Why do we need Helm? Helm is a package manager for Kubernetes. With the help of Helm we can standardize the deployments and offer easy one click/command deployments to users and developers. The developers have the possibility to customize options like size, version, etc. StatefulSets are required in Kubernetes to scale stateful applications. Using StatefulSets, PostgreSQL can now be easily scaled with a single command. Why do we need Trident? Trident enables dynamic provisioning of storage volumes, also known as persistent volumes or PVs, in Kubernetes. This empowers the developers to provision storage for their application in a self-service manner and on-demand. What does our environment look like? Working Kubernetes/OpenShift (K8S 1.6+ or OpenShift 3.6+) environment. Using Helm simplifies how you deploy/install applications on Kubernetes. Helm helps us create templates which act as a standard deployments for the users. Users can deploy this standard deployment by using just a single command. If users want to customize their deployment they must copy a provided yaml and specify the changes they would like to see, e.g. changing the size or version of PostgreSQL from the standard deployment. Scaling an application deployed using Helm happens the same way as any other StatefulSet. Kapil Arora is a cloud platform architect specialising in OpenStack, Containers and Enterprise Storage. He helps customers with proof of concept implementations and production deployments and focusses on innovation, evangelisation, and promoting the benefits of NetApp storage and software in cloud computing and containerised environments. He has experience working with many big organisations like SAP, BBVA and Deutsche Telekom in Europe and is an active speaker at OpenStack events and conferences. He is very interested in topics like File-share services, Backup and Recovery, Database Applications, and Persistent Storage for Containers. He has 10 years of IT industry experience including close to 8 years in the Storage industry. Kapil is also a Java and Python programmer and has a Bachelors degree in Information Technology.